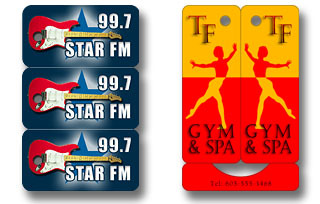 Custom printed Key Tags is the affordable way to retain current customers and attract new ones. Free Offers from Plastic Card City with all Key Tag Purchases! Free Design of Key Tags! Free Online Program to track and process your customer's Key Tags! 3 up Key Tags : 1.125" x 2.125"
2 up Key Tags: 1.0625" x 2.875"
Key tags are used for many applications and require different configurations of data to comply. The back of the key tag can be printed with a number or a bar code/number combination. Each key tag in a set of two or three can have a different number and/or bar code or the same in case you want to give a customer two or more key tags. Barcode types for key tags are for the most part type 128 or type 39. Some applications require a UPCa barcode. Almost all bar code types are printable on a key tag as long as the number of digits does not create a bar code that is too long to fit. Plastic Card City proof method will supply you with a printable barcode for testing prior to printing. For plastic gift cards printing and plastic key tag printing go to our home page and select the product you are interested in. When designing a custom plastic key tag conceder the limitations of the area available for the artwork. As a promotional tool you must utilize the area to maximize the marketing effect you want to achieve. Our free design service would be the best solution, just send your logo and/or any other images and text and we will put it together for you. The front art is your advertising space while the back is for information and the barcode. The plastic lamination on the key tags will enhance the image and help to make the piece and attractive. Make the key tag extra interesting and you will find your customers showing it off to others.